Hosting a garden party or wedding? Drop a couple of these in your guest's drinks and you'll be sure to impress! It's relatively easy. I used lavender, blueberries and mint leaves but you can get creative and have some fun! By the way, this amazing photo is by the super talented Kate Sykus. 1. Gently rinse your chosen fancy ice cube content. Some suggestions include violets, rose petals, pansies, lavender, nasturtiums, strawberries, blueberries and mint leaves. 2. Use boiled water (or bottled water) as this allows all the air trapped in the water to escape and the ice cubes will be crystal clear. Let the water completely cool to room temperature. 3. Place content at the base of each compartment and fill with water half way. Freeze. 4. 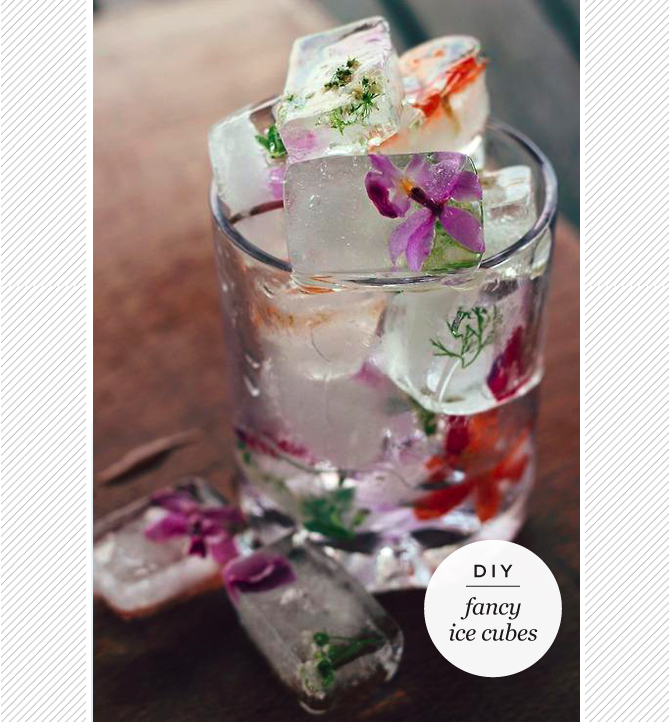 Once frozen, fill each ice cube compartment to the top with remaining water and refreeze.